Hope, the female peregrine at the Cathedral of Learning laid her fourth egg this evening, Monday March 18, at 6:21pm. 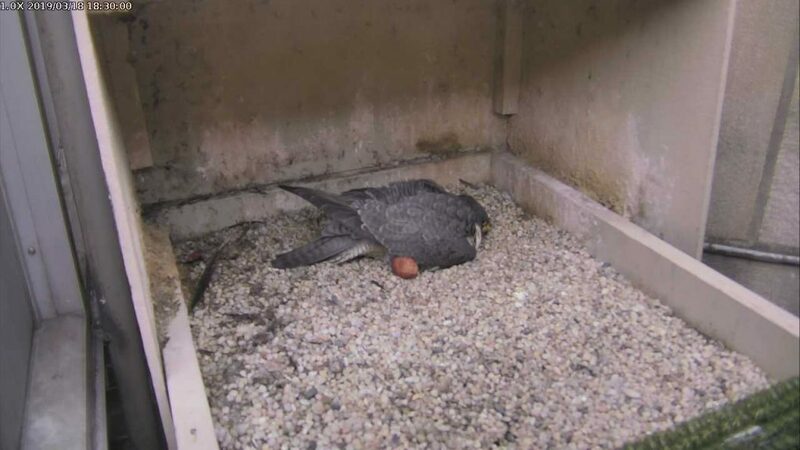 It was hard to get a snapshot of the eggs because she quickly resumed incubation … except for about 20 seconds when Egg #4 was still drying next to her. Then she stood up for a moment and we can see four eggs. Hope and Terzo will now incubate for approximately 34 days. Hatching may occur as early as Easter Day, April 21. I’ll post the annual warning not to watch the hatch on/about April 14.
p.s. 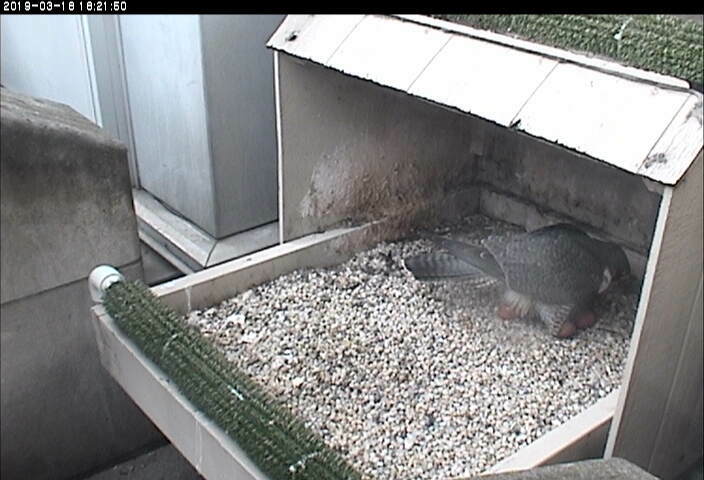 For those who are new to watching Hope, she has a bad habit of killing & eating some of her chicks as they hatch. This is a very rare behavior. It is not normal. We don’t know why she does it. Hoping for 4 successful hatches this year. Always fun and entertaining to watch babies as they interact with each other. Fingers crossed!! I love this nest but switch to other nests during critical period. It was devastating to observe Hope killing and eating her babies. Once past critical period, she becomes a great mom. Such puzzling behavior and even experts find it hard to explain. Fifth egg just after 6am this morning (March 21)!